LED House Number & Street Name Sign - - personalized LED sign illuminates your address for better visibility, provides landscape lighting, and enhances curb appeal. Made in USA. Mount on wall or yard with included stake. Personalized with your choice of lens color, font, power option, and the house number & street name you provide. Five font options (click second small image): twcent, century 751, poor richard (shown in large image), brushed script, and vonique. Dimensions: 12.5"W x 8.5"H x 1"D.
Sign is always on, but illumination effect is visible only at night. Approximate yearly operating cost is $5.00. 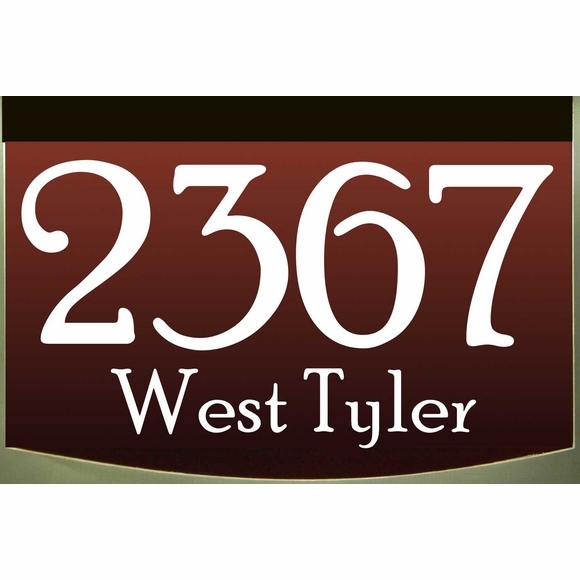 Address shown in large image: P2367 West Tyler.